The Colour Your Day With Happiness Bouquet blooms with blushing sweetness to offer your special someone a gift of charming cheer. This is a beautiful combination of favourite flowers including large-headed rose, carnations and germinis all in mixed shades of pink with white. This hand-tied bouquet is a fabulous gift that is sure to bring happiness to their day. 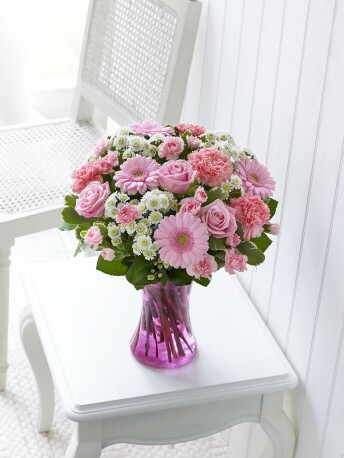 Featuring pink large-headed rose, pink carnations, pink germinis, light pink spray carnations and white spray chrysanthemums with pittosporum and salal leaves, hand-tied and beautifully presented in a pink swirl glass vase.